164 pages. Color & B/W. 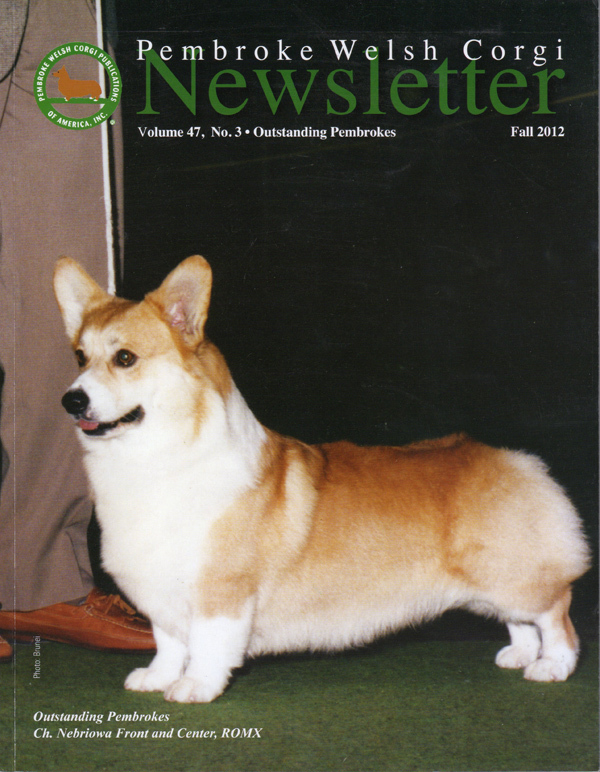 A single copy of the Fall 2012 issue of the PWC Newsletter featuring Outstanding Pembroke Welsh Corgis Ch. Nebriowa Front And Center and Ch. Martindale Butter Brickle as top producers cover article by Marian Your. History of the PWCCA Challenge Trophies by Carol Donnelly & Dora Carter; 2012 ROM & ROMX listing & Top Producing Sires & Dams; Outstanding Performance Pembroke, MACH4 High Flyer Ceridwen, CD TD by Jane Glier; Update on the AKC Herding Program by Judy Hart; Spotlight on Gaitway PWCC; Talebearers; 2012 PWCCA Handbook Order & Entry Forms; Results, critiques and win photos for Greater Atlanta, Potomac, Garden State, Golden Gate, Southern California, Gaitway and Mayflower Specialty Shows; Event Calendar; Columns and advertisings featuring winning Pembrokes. Available only as long as supplies left. Please choose "Domestic" or "Foreign" shipping in the Price Options dropdown menu.